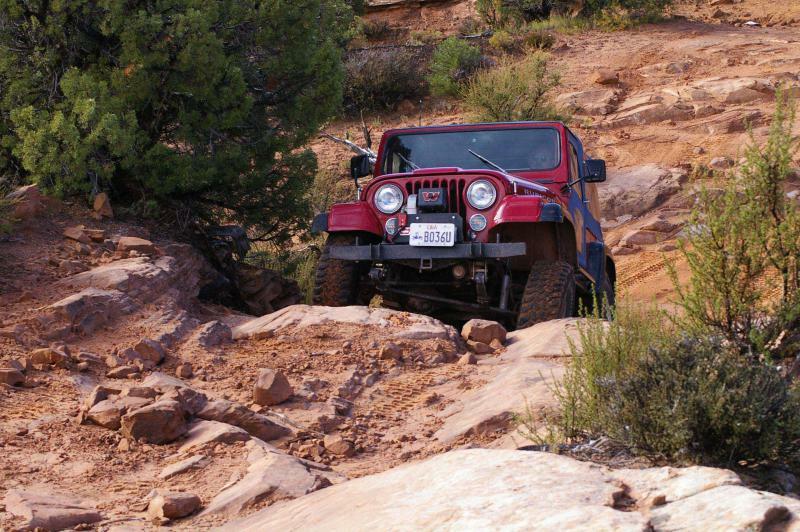 This trail tours the “Behind the Rocks” country just like the regular Behind the Rocks Trail, but only passes near the nasty hills at High Dive Canyon and White Knuckle Hill for the amazement of those who keep their driving at the lower rated trails. 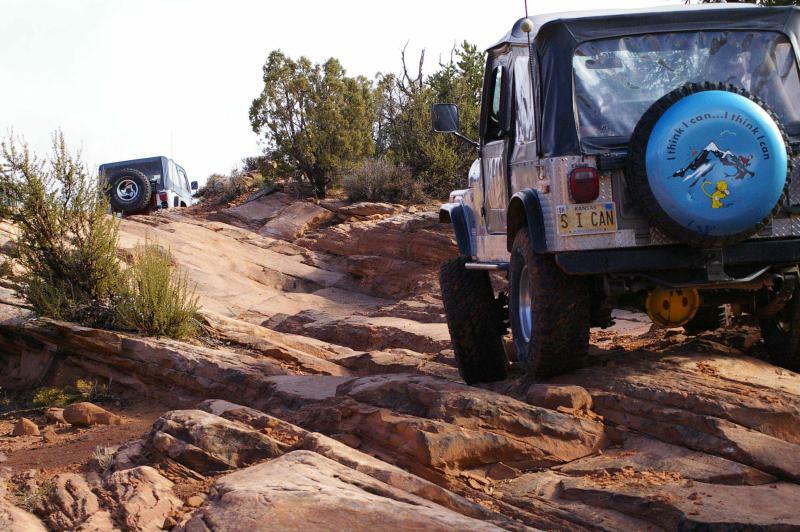 The Tip-Toe routes intersect the difficult version of Behind the Rocks, and even share a few miles of easy trail portions, but the portions that are exclusive to this trail are especially scenic. 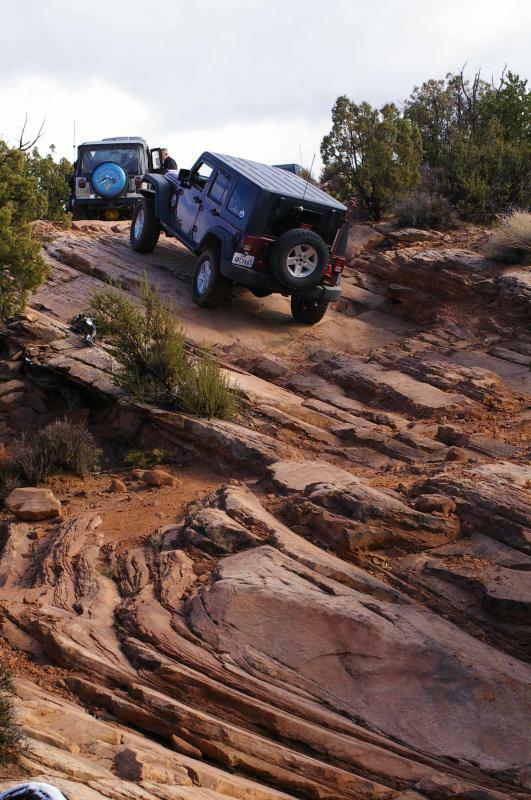 The difficulty rating was bumped a few years ago because of continuing erosion of some rocky descents where we usually have to re-arrange rocks every trip. The rock layers slope downward behind the cliffs, and the virtually impenetrable Navajo Sandstone domes and fins of the Behind the Rocks Wilderness Study Area are in view most of the time. 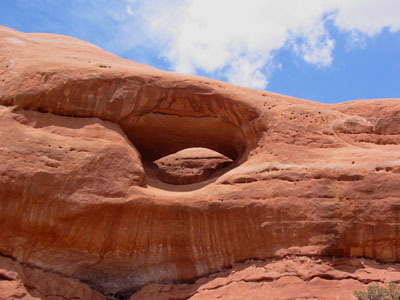 Balcony Arch, Picture Frame Arch, and Pritchett Arch may be seen at a distance (but close-up on Mondays hike). 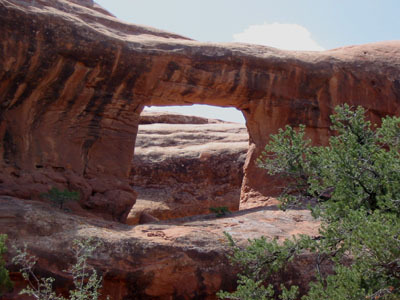 There is a spectacular pour-off of Hunters Canyon with a small natural bridge above a pool and hanging gardens that are fed by perennial dripping springs. 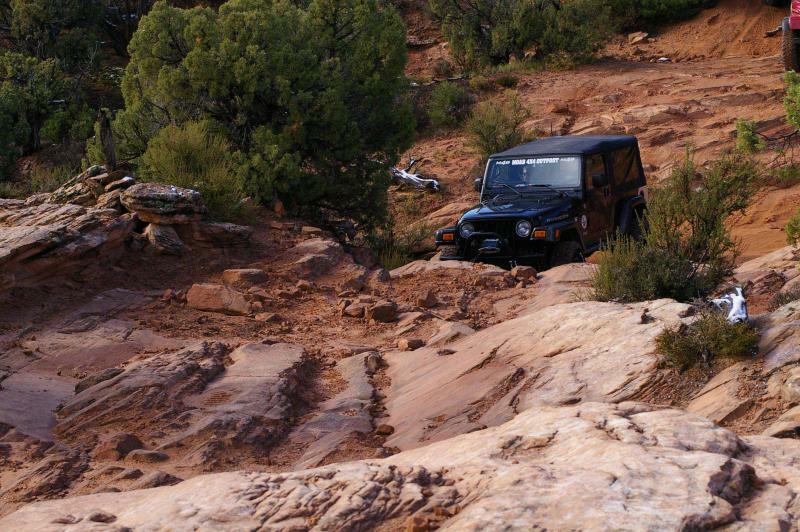 Most of the road is sandy dirt with occasional rock outcrops. 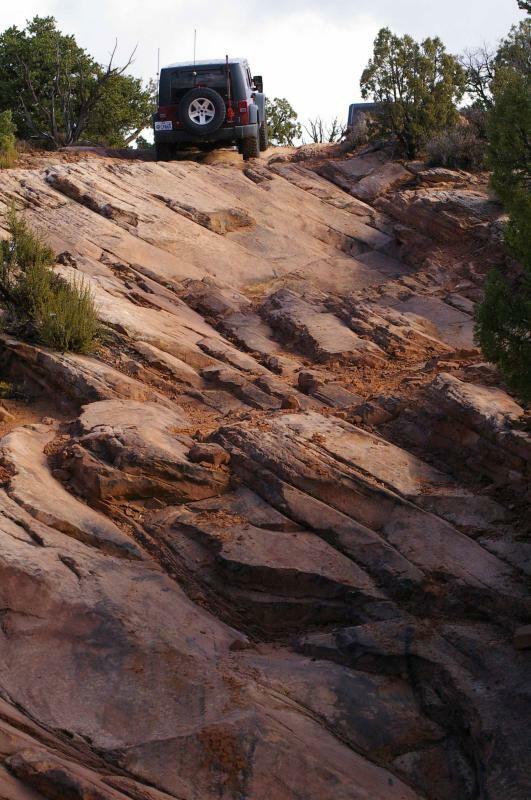 There are a few minor drainage crossings that have exposed rock ledges requiring a bit of technique to climb with equipment that is close to stock. 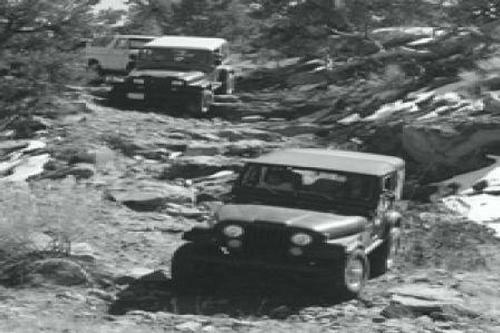 The downhill route into Hunters Canyon may require some rock positioning to carry those with less lift and tire diameter. 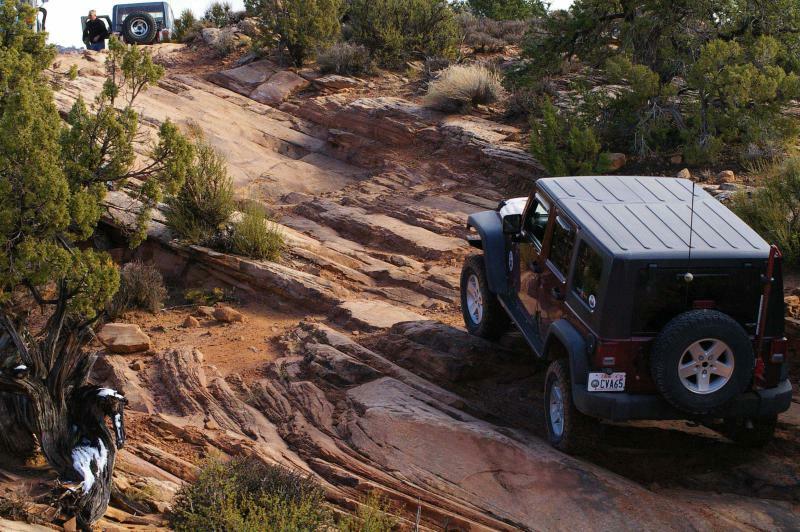 Even so, the sound of metal skid plates on rock will be common.